Studies within behavioral economics usually investigated loss aversion for individuals, whose decisions directly affected their personal outcome. However, many decisions in real-world scenarios are made on behalf of others. In particular, an individual’s actions affect the outcome of a second person. In recent years, some research papers analyzed loss aversion when deciding on behalf others, but their findings are rather mixed and lead to different conclusions. The equivocal results can mainly be attributed to the different approaches and structural models used. 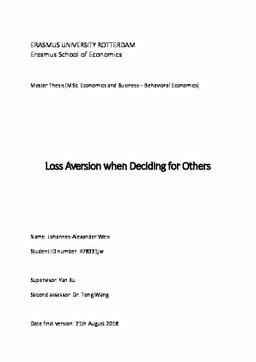 Furthermore, previous research compared loss aversion when deciding for oneself to deciding for a stranger. Thus, only two extreme cases of social distance are considered, whereas a “middle” alternative is missing. Consequently, this research project aims to fill a gap in the literature by trying to answer the research question: Is the effect of loss aversion reduced when deciding for others? Therefore, a new non-parametric method is applied, which has not been used before to analyze loss aversion when deciding for others. Additionally, the experimental design adds a third alternative of social distance, which represents deciding on behalf of a friend or a family member. It was expected that loss aversion is reduced when social distance increases. However, the analysis of the collected data demonstrated that loss aversion is not significantly reduced when deciding for others. The limitations of this paper and the mixed results within this research field demand more in-depth research on loss aversion when deciding for others.